Finding dog clothes that actually fit dachshunds can be like a needle in a haystack… hard to find! Dachshunds are extra long in length and extra short in height. So, it can be tough to find the right dog clothes that can accommodate your dachshund’s unique stature. After researching several dog clothing options, I found that the Django Dachshund Puffer Dog Jacket to be the best fit for our extra long, extra short friends. For my Dachshund, it is the only comfortable coat he is Willing to wear. Why do you need dachshund clothes? Dachshunds really don’t like the rain, snow, wind, or cold winter weather. All dachshunds enjoy being in a warm and cozy home. Keeping your doxie warm and visible with reflective material is important. Did you know they make winter coats, warm sweaters, and raincoats that will fit your dachshund? 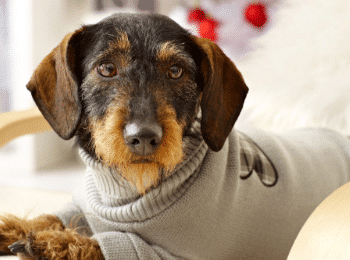 There are many important factors to consider when choosing the right clothing for your dog (especially your dachshund). Quickly getting dressed: Dachshund coats and sweaters need to be easy to put on. Dachshunds don’t mess around, if they don’t want it on, they will give you a hard time. Comfort: Will the Dachshund keep the clothing on? That all depends on their comfort level. I put a shark costume on my dachshund Reno, and he refused to move while he was in it. I couldn’t stop laughing, he was adorable, but he wasn’t happy and refused to move. Durability: Some questions to ponder: Will the Dog chew and rip up the nice new doggie clothing? Will it get ruined if they have to stop and go potty outside while on their walk? Visibility: Does the clothing have reflectors or reflective material on it to help others see your proud dachshund coming? 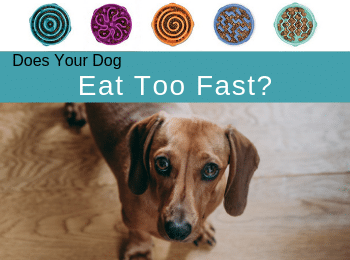 Clean up: Can the Dachshund clothing easily be cleaned up in the washing machine? #1 Choice: The DJANGO Puffer Dog Jacket and Reversible Cold Weather Dog Coat has full coverage for your dachshund’s length, is weather-resistant, and is made with durable materials. Includes a leash portal in the back for easy access. This winter jacket is designed with your dachshund’s mobility needs in mind, it has extra large arm holes for maximum flexibility. Also comes in a variety of colors and sizes. My Canine Kids Precision Fit Sport Parka Best Dog Coat Waterproof Warm Winter Dog Jacket is also a nice choice for your doxie on a cool winter walk. It includes an easy access leash portal in the back. It comes in a variety of colors and sizes. It is adjustable, water proof, and washable. 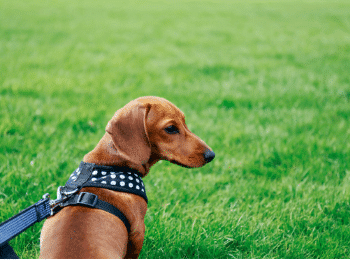 This Safety Vest is a must for your daily walking routine with your dachshund. It comes in many different sizes. Easy to put on the dachshund and is made of super durable material. The bright orange color and reflectors make it hard to miss your dog while wearing this vest. It also comes with a No Risk Guarantee. The DJANGO City Slicker Water-Repellent Dog Raincoat is my favorite Raincoat for my dachshunds. It is made with durable All-weather materials. It is water repellant, so it is perfect for that quick walk outside in the rain. This raincoat also has reflectors for better visibility. It includes a leash portal for easy access and is machine washable. This raincoat is extra long in length to help cover all of your dachshund’s back. The Django dog Hoodie Sweater has an Elastic Waistband and Easy access leash portal. The doggie hoodie is super soft and stretchy too. It comes in a variety of colors and sizes. The special shape of the hoody sweater along with the elastic material around the belly area allow enough room for going potty outside without getting messy. Reflective for Cold Weather for Extra Large to Small Pets. This fleece dog jacket is also a nice choice for simple on and off access. It has a reflective strip on the front of the jacket and is machine washable. The Outward Hound Granby Dog Life Jacket Beats Them All! Are you a dog parent that loves to take their dachshund with them on awesome adventures? Well, if you love to go swimming or boating with your dog, get your dog a life vest. This life vest has two grab handles for easy pick up out of the water. It comes in a bright orange color so you can never loose track of your wiener dog. This is specially designed to keep your dog’s head out of the water with foam panels that help promote buoyancy and security. It comes in different sizes. 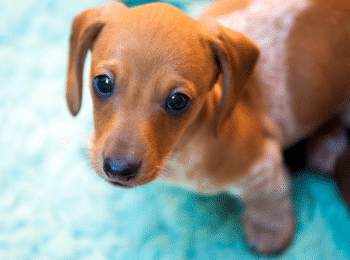 So, whether you have a miniature or a standard dachshund, they will have a size just right for your doxie.